Fri., Sept. 7, 2018, 1:17 p.m.
GAZA CITY, Gaza Strip (AP) – A teenager was killed and dozens of other Palestinians wounded by Israeli fire at a border protest, Gaza officials said Friday, as efforts by Egypt to mediate a possible ceasefire between the territory’s Hamas rulers and Israel appear to have stalled. Gaza’s Health Ministry said a 17-year-old was killed and 45 others were wounded by Israeli fire at Friday’s protest. Separately, it said a 19-year-old died of wounds sustained weeks earlier. Israel’s military said it struck a Hamas observation post after Palestinians threw a grenade at its forces. Palestinians also threw firebombs and rolled burning tires at soldiers stationed along the border, it said. Thick black smoke hung in the air from tires the protesters set ablaze. Israeli soldiers perched on high earthen berms behind the border fence hit several protesters in their legs. Some protesters burnt effigies of U.S President Donald Trump. Showers of tear gas were launched at the protesters from a drone and cannons mounted over military jeeps. Hamas, the Islamic militant group that rules Gaza, has led weekly border protests since March 30 aimed in part at drawing attention to the Israeli-Egyptian blockade imposed after it took control of the territory in 2007. The demonstrations have been fueled in large part by pervasive despair caused by the blockade that has caused widespread economic hardship and left the coastal territory with crippling fuel shortages and just a few hours of electricity a day. Maher Mohammed, 41, a Hamas government employee, attended Friday’s protest with his only daughter. “She wants to participate as a minimum duty,” he said of his 18-year-old daughter. It was her first such protest as she had been busy with school, he said. “We want the siege to be lifted, we want electricity, water … at night we sleep on the (cooler) floor because of the heat,” he said. Violence escalated several weeks ago and the sides came close to serious conflict. Hamas has indirectly negotiated with Israel through Egyptian mediators to pacify the tense border in exchange for easing restrictions on Gaza. 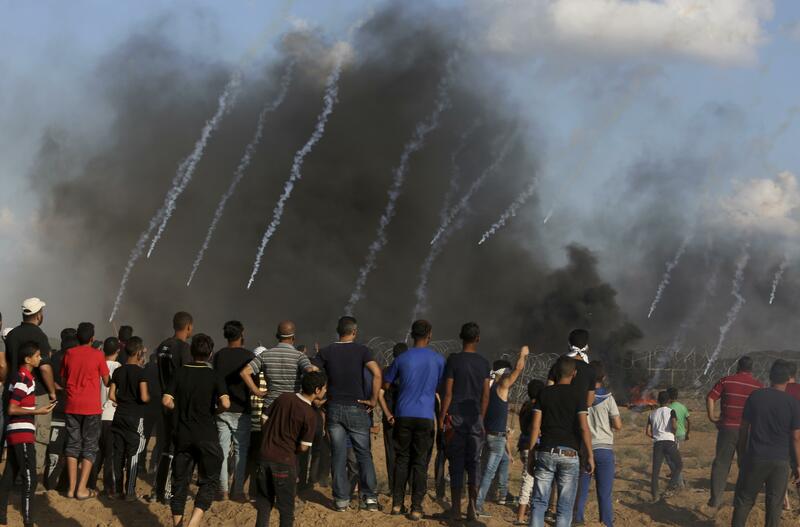 However, the efforts seem to have hit a deadlock.Since the rallies began, at least 127, mainly unarmed, protesters have been killed by Israeli fire, according to the Hamas-run Gaza Health Ministry and a local rights group. An Israeli soldier was killed by a Gaza sniper during this same period.Israel says it is defending its border and accuses Hamas of using the protests as cover for attempts to breach the border fence and attack civilians and soldiers. Palestinians have thrown explosive devices and opened fire at forces along the border in numerous instances over the past few months, the military says. But the high casualty rate among mainly unarmed protesters has drawn international criticism. Published: Sept. 7, 2018, 1:17 p.m.